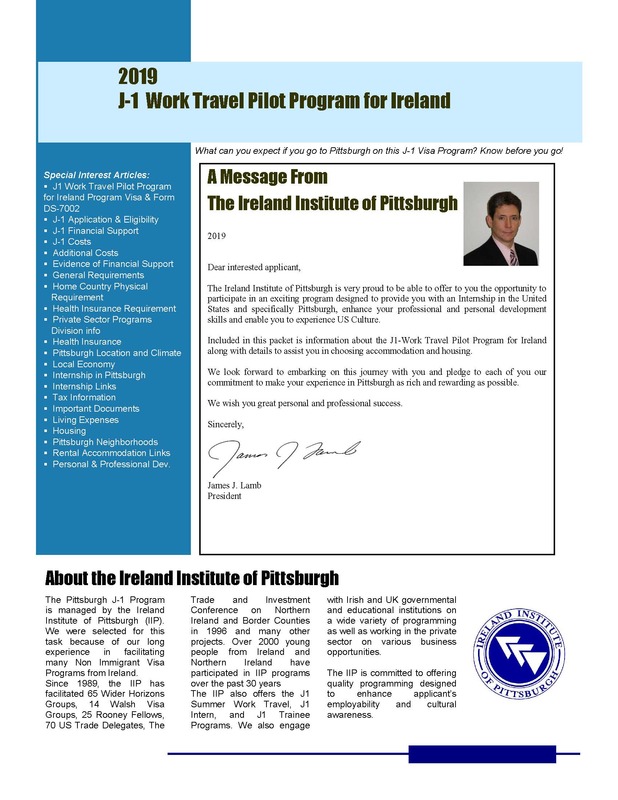 J-1 Irish Work Travel Program 2019 (aka Irish Grad Visa). Application Link at the bottom of the page. Includes Administration costs, other social services as provided by case manager, and the cost of a site visit, if needed. The program is open to Irish Citizens only, currently enrolled in and actively pursuing a degree or students that graduated no more than 12 months prior to date of intended arrival in the US. Participants do not have to have an Internship pre-arranged before arrival in the US and are eligible to engage in a paid internship, in their field of study, for one year. However you must have an approved internship within 2 months of commencement of your program. The visa will be issued for 12 months and you can come into the US up to 30 days prior – and leave up to 30 days after that period. Please ensure you have read to J1 IWT information pack before proceeding. Click on image for download link. Registration Application form filled out online. Link below at bottom of page. DS-2019 Issuance: Once we have approved your application, we will issue the DS-2019…this is the document you will take with you to the US Consulate/US Embassy in Northern Ireland or Dublin, etc. Once it is issued – you will be emailed with two sets of codes that can be then used to book your interview with the embassy/consulate. You don’t need to have the physical paperwork in hand to book the interview – but you must have it in hand to go to interview. So when booking you should schedule longer than one week . The DS-2019 will be mailed – it will take about a week to get there. If you wish it to receive it by Fedex – we will pass this charge onto you. The Rules & Regulations form (download) must be signed, initialed where appropriate and dated. PDF Format (1 document, multiple pages). Proof of College Attendance Form (download) – Stamped and signed PDF. Scan of biographic page of passport which must be valid for the period of the visa. JPEG Format. It must be a scan and not a photo. Bank Statement showing you have minimum $1500 available to you. PDF Format.